I love to shop for my loved ones. I love it when I come across a website and find such amazing items that are perfect for letting someone know how you feel about them. With Easter and Mother's Day coming up, now is the best time to start shopping. I was given the chance to do a review on a lovely item from the Red Envelope website. I was so excited just looking at all the amazing items that are available from their website. With so much to choose from, it took a long time to decide exactly who would be getting what. Some of the gifts you are able to purchase include: jewelry, apparel, women’s accessories, flowers, plants, gourmet treats, baby, kids, gadgets, bath, spa, birthday and more. 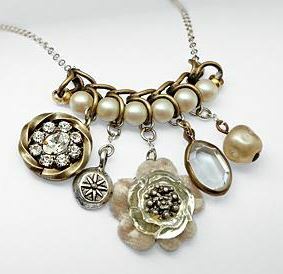 Get your Gatsby on with this exquisite cluster of vintage charms. 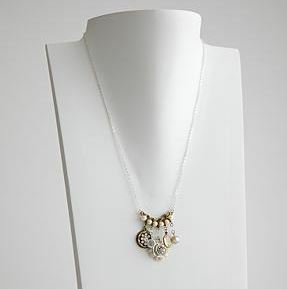 We partnered with renowned reclaimed-jewelry artist Jill Schwartz to create this intricately stylish piece. Handcrafted in the USA of reclaimed gold and silver chain, pearls, and nostalgic baubles and trinkets, its vintage feel pairs with modern design sensibilities to create a unique and highly wearable piece. Exclusively from RedEnvelope. I love vintage inspired jewelry pieces. I feel that there is a feel of old charm when you wear a vintage piece. I was so excited when I opened the red envelope box and saw my Delicate Vintage Charm Necklace and immediately fell in love with its beauty. The necklace adjusts from 22" -24" allowing you to wear the necklace at whichever length is best for you or the shirt you are wearing. Each charm is beautifully detailed and they all match each other perfectly. I have worn the necklace several times and I love how it lays on my neck. It has a look that can go with so many different outfits and really achieve a look of elegancy when worn. I really really like this piece and I know where I will be shopping for the upcoming Mother's Day. About the company: Founded in 1999, RedEnvelope is born of ancient Chinese custom where meaningful gifts are presented in a simple red envelope. This time-honored tradition carries with it wishes of prosperity, good fortune, appreciation and love. The color red in many Asian cultures is an auspicious symbol of happiness. You can show some love by liking Red Envelope on Facebook. Where to purchase: You are able to make a purchase from the Red Envelope website. Prices will vary depending on what you purchase.